Do advancements in display advertising make advertisers better off today compared to four years ago? While that question might seem more appropriate for trying to sort through political policies during a presidential election year, it’s also relevant to the evolution of “premium” display ads, as technologies like programmatic buying and native ad units take hold. Ad pundits have already made display advertising the most jargon-littered playing field in the digital realm, forcing most of the world to constantly dodge a steady barrage of acronyms, from acc to dtp to ros to … wtf. Adding to the confusion is the constant evolution of what premium display — the industry’s alleged crème de la crème — actually means. To most major media brands, for example, “premium” still means banners and high-impact branding ad units on name-brand media sites. It refers to the unmissable banner ad for, let’s say, Acura or Lincoln Mercury that viewers see when they check on cnn.com for the latest headlines or espn.com for baseball scores. 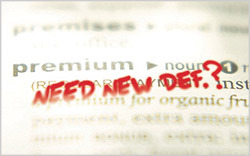 But for the more tech-driven companies, especially the dsp (demand-side platforms) or rtb (real-time bidding) players, the word premium is being redefined as “whatever performs.” In fact, the term “premium display” gets tossed around so much no one is sure what it means any longer. The ad tech space continues to evolve. The advent of rtb, which relies on automation and a machine to do the work, and Facebook Exchange will continue to change the dynamics of the marketplace. Premium ads integrated with social context will become the voice of the brand and prompt people to take action. The sun isn’t setting on display ads. Brands will simply integrate native elements that create shiny objects through an established media. But trying to figure out exactly where traditional display ads fit in today’s mix seems almost as difficult as trying to coax an undecided voter into either the Republican or Democrat camp this November: Both sides think they’ve got it all figured out, but there are still plenty of unanswered questions. Technology advances in social and automation don’t mean the end of display ads. They just mark the beginning of a hybrid model where ads follow editorial content and have an unobtrusive conversation with consumers. Consider a high school senior in California. On YouTube, surfing through skateboard videos, he clicks on a premium native video ad, this one for Chevrolet’s Sonic, watches for a few seconds, and then continues to jump from video to video. That creates a boost for brands. Revenue generated by display ads in the u.s. should reach $15.4 billion this year, up 24 percent from $12.4 billion in 2011, according to estimates from eMarketer. Publishers create content to build loyal, engaged audiences, but they typically deploy display ads or interruptive pre-roll video on their sites rather than encouraging brands to integrate media that will stimulate a conversation. Clearly, premium display ads win votes from brands looking to deliver the message. Once a static picture on a Web site, technologies like html5 and rich video enable images to fly off the page. Video connects with consumers who digest more than 32 hours of video monthly, according to Wayne Powers, senior vice president of North America sales at Yahoo. Traditional premium display-ad units integrating video appear to be headed toward branded entertainment, for example. Powers says advertising becomes part of the experience. That type of experience, however, depends on whether a person consumes content on desktops, smartphones, tablets or smart tvs. Advertisers will need to become more creative with immersive ads. He points to ads frequently promoting movies where characters pop out and move across the screen to capture the viewer’s attention. Premium display ads now allow consumers to view the trailer and buy the ticket to attend a theatrical release. Connecting with the consumer, Apple ran an expandable takeover home-page display ad one Sunday in December on Yahoo’s portal to demonstrate a new product’s features. The idea to connect with consumers took the advertisement beyond the typical display ad by adding niche content and links to places where consumers could go to make a purchase, Powers says. Advertisers want a better way to engage existing and potential customers. Suzie Reider, head of industry development at YouTube, points to an emerging trend in niche marketing, rather than advertising. Marketers have tightened the purse strings on traditional advertising to connect with consumers through conversation, sponsorships and branded content. “Commercials must act as content; you need an opportunity for interactivity and dialogue; and the campaign must scale,” she says, suggesting these three trends will drive YouTube’s business this year. Brand advertising execs will continue to want interesting home pages, but they will become more aware of innovating in the available real estate. Mobile devices are now so ubiquitous that the number of connections surpasses the u.s. population. Mobile Internet users now comprise half of all u.s. Internet users, and by 2016 the number will grow to 75 percent, according to eMarketer. And display remains the fastest-growing sub-category of advertising media, with 20 percent annual growth, thanks to the rapid rise of social media and online video advertising, according to ZenithOptimedia. By 2014, Publicis Groupe’s research arm expects display to reach 40 percent of Internet advertising, up from 36 percent in 2011. ZenithOptimedia predicts social media’s share of display to grow at an average rate of 31 percent during the next three years, achieving an 18.5 percent share in 2014, up from 14.4 percent of Internet display advertising in 2011. Native targeted display ads provide the best results. (Native means ad units that are specific to a media type, like sponsored stories in Facebook, promoted tweets on Twitter or branded videos on YouTube.) In Facebook, ads based on content, rather than messages, have a better chance of scoring big with members. But creating these native ads isn’t easy. Ari Jacoby, ceo of Solve Media, which replaces captchas with brand advertising, points to two major challenges: additional work to create an opportunity, and whether the agency can create enough scale to make the investment profitable. Brandt says marketers and their ad agencies are responsible for selling products. To sell products, the ad must tell a compelling story about the product. To tell a compelling story, agencies need a “real palette” to capture the attention of consumers. He says it becomes difficult to tell a compelling story, not to mention sell a product, with native units. Unlike Brandt, Demand Media chief revenue officer Joanne Bradford says advertisers want to break out from the within the walls surrounding “pure advertising” and become part of the conversation with consumers. The savvier brands look and find ways to connect with consumers through useful content, which keeps the brand top of mind when those same consumers get ready to make a purchase. Are those same savvy advertisers comfortable enough with automating premium display ads that embed native content to connect more closely with consumers? High-impact and native media in display-ad units will continue to evolve and support models not typically found at the top of the marketing funnel. rtb, paying per impression rather than per thousand, remains one media missing from the mix. It can work with advances in display technology that hold all parties accountable. Tools, such as DoubleVerify, ensure the ads serve up within plain view in the browser window. Some believe a hybrid model will emerge, supported by audience-targeting platforms like eXelate or Xaxis. rtb for premium ad buying would rely on data and audience segments to signal ad networks to bid or not to bid for that single impression. Automation brought rtb to display advertising at the bottom of the marketing funnel, but the concept could support takeover and native ads at the top, as well. How could programmatic buying work to support the sale of home-page takeovers? The industry would need to create a hybrid model. The major problem becomes publishers losing control of pricing in the rtb model. The highest bidder wouldn’t get the impression. Publishers and advertisers would need to agree on the cost-per-impression in advance, rather than selling the ad unit to the highest bidder on-the-fly. The hybrid model might not guarantee placement on certain sites, but it would guarantee high-quality placement based on a predetermined price per impression. Ads running one-page deep on a Web site remain valuable, and most brands will pay more for that space, Beaumier says, so expect to see higher cpms from publishers. The advertising industry will find new ways to integrate native media in desktop and mobile display ads. rtb becomes a more efficient. Some publishers don’t want to open home-page takeover ads or premium ad units to bidding for impressions in the rtb model.